Ontario is providing more support for children and youth with autism, including an accelerated implementation of the new Ontario Autism Program. Ontario is providing more support for children and youth with autism, including an accelerated implementation of the new Ontario Autism Program. The new program will provide all children, regardless of age, with more flexible services at a level of intensity that meets each child’s individual needs, significantly reduce wait times for service, and increase the number of treatment spaces available to serve more children and accommodate the rising prevalence in autism diagnoses. A choice of direct funding or if preferred, immediate and continuous access to Applied Behaviour Analysis (ABA) services and supports, for children five and over who were previously on the Intensive Behavioural Intervention (IBI) waitlist. This funding will provide access to continuous service until the child is able to enter the new Ontario Autism Program next year. Strengthened in-school autism supports to help children transition to and continue in full-time school. Increased access to diagnostic assessments to allow for earlier diagnosis and treatment. Greater access to information and direct supports for families to help them navigate the transition to the new program. Implementation of the new Ontario Autism Program was originally slated to begin in 2018, and will now begin in June 2017, effectively reducing the transition period by half. The 2016 Ontario Budget committed $333 million over five years for Ontario’s new autism program. This is in addition to the $190 million that Ontario already invests in autism services for children and youth annually. These enhancements will invest an additional $200 million over the next four years to better support children and youth with autism and their families. An advisory committee of parents, stakeholders, advocates, service providers and experts will begin meeting this summer to provide advice to the ministry on the design of the new program. Families affected by these changes, or who have questions about the new Ontario Autism Program, can call 1-888-284-8340 for information, or contact their regional office or service provider. Parents can call 1-888-284-8340 toll-free for more information and to find their nearest ministry regional office. The Ontario government has backed away from a controversial age limit it imposed earlier this year on funding for intensive therapy for children with autism, and has introduced a new program for therapy funding in the province. Minister of Children and Youth Services Michael Coteau made the announcement shortly after 9:30 a.m. ET Tuesday in Toronto. In March, the province announced $333 million in funding for autism programs over five years, but also eliminated government-funded intensive therapy for children aged five years and older. The move was widely criticized by affected families and advocates, and the ministry said in a media release Tuesday that it “has listened listened closely to experts, stakeholders, service providers and families” since then. The government’s new autism plan adds another $200 million over four years to speed up program delivery and provide $1,000 per week for therapy for children five years old and up while they’re on the wait list. The transition to the new program will begin in June 2017 instead of 2018, the ministry said. “The new program will provide all children, regardless of age, with more flexible services at a level of intensity that meets each child’s individual needs, significantly reduce wait times for service, and increase the number of treatment spaces available to serve more children and accommodate the rising prevalence in autism diagnoses,” the province said. A choice of direct funding or immediate and continuous access to applied behaviour analysis (ABA) services and supports for children five and over who were on the intensive behavioural intervention (IBI) waitlist, to provide access to continuous service until children are able to enter the new program next year. Strengthened autism supports in schools to help children transition to and continue in full-time school. Greater access to information and direct supports for families to help them transition to the new program. Ottawa resident Heather Bourdon’s son Jacob was nearly a month away from turning five when the March announcement to cut funding was made. Bourdon said families with less financial resources were hit even harder than her own because intensive therapy costs thousands of dollars every month. Two months of therapy for Jacob, from May 1 to June 30, cost $11,500. 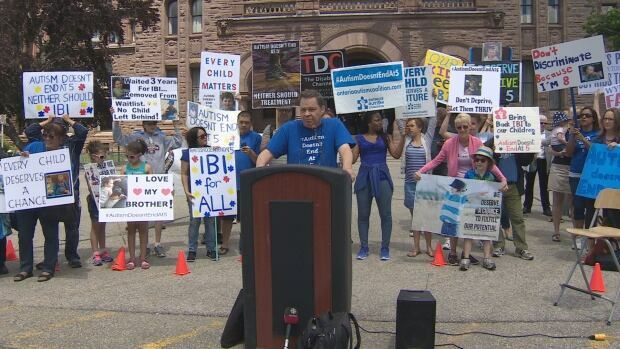 The cut-off sparked months of protests, letter-writing campaigns and social media advocacy by parents as well as advocates, including Bruce McIntosh, president of the Ontario Autism Coalition. “We had parents from Windsor to Ottawa, and we had them from Sudbury to Niagara. You name a town or city and they were there,” McIntosh said. McIntosh had seen the ministry’s announcement before Tuesday morning and said he was excited about what it means for the province. 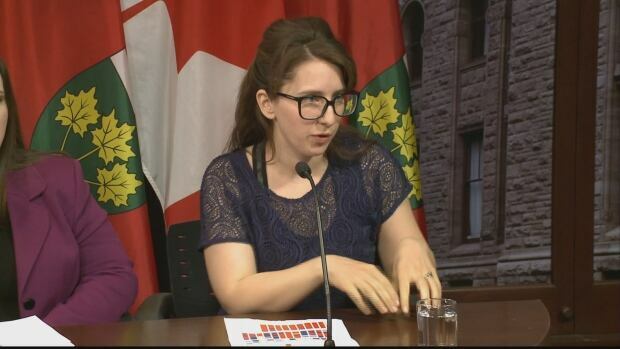 The Ministry of Children and Youth Services said Tuesday’s announcement was the result of work with advocacy groups such as the Ontario Autism Coalition, families and therapists. Premier Kathleen Wynne had signalled her government might change its position on the autism policy and recently replaced the minister responsible for the change, Tracy MacCharles, with Coteau. Ottawa resident Heather Bourdon, whose son Jason has autism, went to Queen’s Park to fight against the Liberal government’s decision to cut off funding for intensive therapy to children older than five. “What the parents are looking for more than anything is a clear statement that if their kid is over the age of five and has a severe diagnosis, that they’re not going to get thrown under the bus, that they will get intensive intervention,” said Anne Jovanovic, who speaks for the Alliance Against the Ontario Autism Program. Stakeholders said the province would announce a “direct funding” model to give parents more choice over where children receive services. That would involve a clinician and the family determining the appropriate level of intervention for each child, and a funding envelop from the province that would be used towards that treatment. Jovanovic said advocates had been calling for a direct funding system for children with autism. The Ontario Autism Coalition says it will be participating in a 12-member implementation committee to guide the transition under the new policy.